This is a hexagram about crime. It’s a hexagram about identifying crime, enforcing the law, prosecuting the crime, and handing out just punishment. It’s like a Law and Order spinoff launched right in the middle of an ancient Chinese text, which I honestly think would make for a pretty entertaining, and even thrilling, show. In the world of our show, we’ve got a halfway harmonized society that is literally being prevented from coming together by – no other way to put it – criminals committing crimes. We are told of slanderers and traitors and bad actors of all stripes and skills imaginable. Against these challenges, our instructions are even more clear than usual. We must meet the crime wave head-on, nip it in the bud, as early as possible, so that it does not fester and cause lasting damage not only to the direct victims of the criminal behavior but to the whole of the people. It’s compared to having something jammed up in your mouth in such a way that you can’t close it. Obviously you have to be able to close your mouth, so there’s nothing to be done except use your teeth to bite your way through it. You don’t want to wait and take care of it later on, either, because you need to close your mouth now. So it is with society at large, and your responsibility exists within. When there’s an unsustainable tension in nature, the lesson continues, nature doesn’t mess around. Nature sends in the artillery of lightning and thunder and the problem is handled effectively and immediately. That’s right: lightning is nature’s justice. The way we counter with justice the crimes which drive us apart, those corruptions and deceptions and exhortations to wealth and flare-ups of greed, is to look to the solidity and order of the law and bring the hammer down. The hammer, not the billy club. Yet even when wielding a hammer and imitating an electrical storm, proportion and order must be maintained. It’s a prosecution we’re talking about here, not an inquisition. 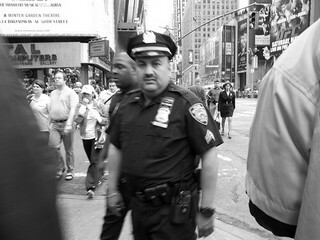 Crime and punishment – law and order – is not black and white or standardized across the board. Each individual circumstance calls for a particular and appropriate response in order that justice be met and harmony be restored to the whole community. Punishments and penalties are not ends unto themselves but are means towards this justice and this harmony, and this goal must be kept in mind throughout the proceedings. For example, for a first offender, you slap him with a punishment, but a minor one designed to serve as a warning and an opportunity for the petty early criminal to move forward in life and obey the law in the future. Other times, right and wrong are very clear, and the criminal in question is not only seasoned and aware of his own criminality, he is acting with premeditation and flagrant disregard for the well-being of anyone. This is an evil, evil person incapable of rehabilitation or remorse. 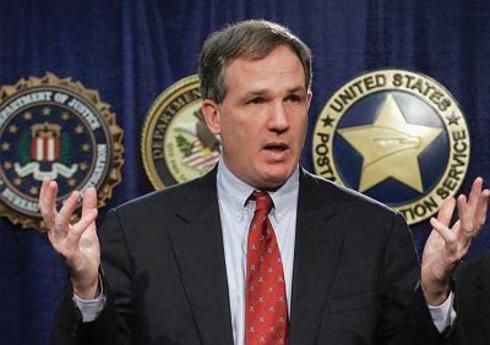 Send in Patrick Fitzgerald. You gonna mess with this guy? You might, in such a circumstance, get so angry that you go a little bit overboard and mete out a little more harshness than is perhaps technically called for. The funny thing about the I Ching, though, is that we’re told there are no real bad consequences in this case because the criminal behavior and degenerate character is so bad and egregious that nobody minds or cares. Then there will be circumstances in which the balance of power between prosecutor and defendant is out of whack. If it’s your job to prosecute, but you lack the means or even the perceived authority to succeed, it’s your job to try anyway even if this leads to certain failure. Again, though, even if the defendant sneers at you and lashes back with a counterattack of his own, you’ll face no lasting bad consequences because you lived up to your duty and acted in accordance with true justice. The unruly party will get his just as soon as someone with more juice than you shows up. Other times, you won’t be viciously attacked or find yourself in need of a higher authority to come in rescue, but though the case is pretty clear-cut and obvious, the difficulty of going up against these opponents is daunting and perhaps not prudent. There are some such moments in which an inclination towards a slightly more lenient plea-bargain can prove acceptable so long as you don’t let your guard down and allow other further danger and disharmony to fester and gain a foothold. Then there are times you may find yourself faced with a very powerful and destructive criminal, but though you know the work and dedication and sweat that will be required, you go into it with determination and immense strength. Putting your head down and charging into the breach, if you do what you know ahead of time will be required, you will complete the task and you will win your conviction, releasing society from a large and powerful menace. Also, it should be noted that all those who are obstinate in their pursuit and worship of wealth invariably become degerates. The law and its punishment will always catch up with them. 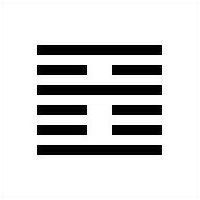 Overall, though, if there can be said to be a mild and subtle political undercurrent to this hexagram, it’s that punishment is necessary, but it must never be either too severe and violent or too lax and forgiving. Punishments must hold to the same level of justice as the laws from which they are derived. Without this solid integrity and proportion, the system will not work. Justice depends upon its own consistent and fair application. We all deal with scourges and spiritual obstacles in our lives that could rightly be described as crimes, crimes which deny or delay our own harmony within and union with others below. We may be comforted in the knowledge that there is the structure of law designed to deal with these obstacles, and that there is not just the possibility of justice, but the likelihood and necessity of it. Go in peace – and justice, and union, and harmony.